DHS - So many ideas for Fund My Neighbourhood! So many ideas for Fund My Neighbourhood! More than 2500 ideas have been submitted by South Australians taking part in the State Government’s Fund My Neighbourhood program. Fund My Neighbourhood is one of the world's biggest participatory budgeting exercises, giving South Australians the power to nominate and vote for projects that improve their streets, suburbs and towns. Ideas received include dog parks, upgrades to sporting clubs, nature playgrounds and community hall renovations. 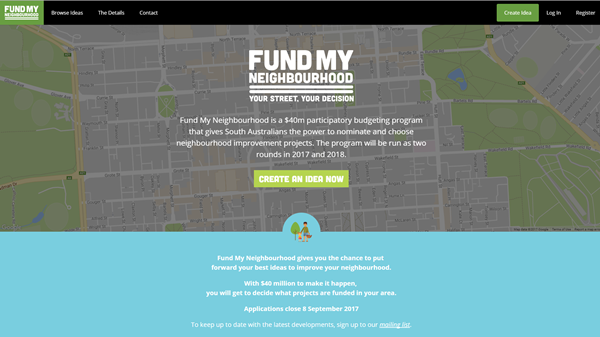 Once they’re assessed, eligible ideas will be published progressively on www.fundmyneighbourhood.sa.gov.au, where members of the public can vote for their favourites. Successful projects will be announced later this year.